Home > Uitgevers > What's Your Game? 1640 A.D. — a ghastly curse befell a beautiful island in the Indian Ocean. Soon, it was known that its dark magic would not only afflict whoever tried to take away anything from the island, but also haunt whoever even dared approach its coasts, making it the perfect location for pirates to hide their loot. 1902 A.D. — centuries later, pieces of ancient treasure maps were found by you and your fellow treasure hunters. 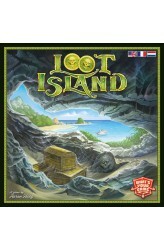 In Loot Island, players play their map cards to the landings of the island in an attempt to piece together enough of a map to find treasures buried there. At the end of each round, an exploration will take place, and if loot is found in a landing, treasures will be distributed among the players present there on a first come, first serve basis. ..
Japan during the Meiji period—a closed, isolated, and feudal country—decides to change into a modern westernized state. The Empire sends emissaries to foreign nations, brings technicians and scholars from the west, builds a network of railroads, and achieves an outstandingly fast industrial revolution. The nation and Emperor count on the support of the Great Four, the big conglomerates that emerge with great power and massive control over the Japanese economy. They are called Zaibatsu, and their influence on the Meiji Emperor and importance on the fate of Japan is incredibly high. 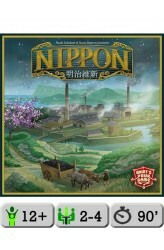 In Nippon, players control Zaibatsu and try to develop their web of power by investing in new industries, improving their technological knowledge, shipping goods to foreign countries or using them to s.. Ambition and a thirst for wealth have driven humanity to strive for ever greater progress. In America, during the 19th century, battles were waged between huge railway corporations that sought to connect state to state and coast with coast… making themselves filthy rich in the process. 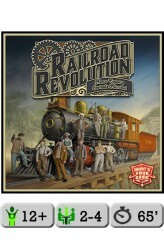 Railroad Revolution drops you straight into the middle of these tempestuous years; a time that changed America forever. In Railroad Revolution, you will manage your own railroad company, ruthlessly competing to be the most powerful railroad tycoon across all America. You will build railroads, establish stations in your connected cities, expand the network of telegraph lines, and chase your objectives, increasing the value of your company with every action you take. You start with mai..
Italy during the 15th century was a country full of intrigue and magnificence. The tumultuous political conditions created the perfect breeding ground for the birth of a new form of government (called Signoria) and the rise of the most ambitious noble families. After having acted in the dark for a long time, the time has finally come for them to take control of the cities and shape Italy’s future. Their stories will go down in history. 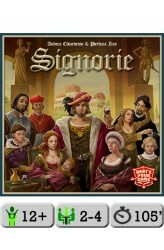 In Signorie, you will play the role of a Signore, a Lord of one of the most prestigious families of the Renaissance. One at the time, players choose one die from a common pool. (Twenty dice in five colors are rolled at the beginning of each round.) You place it on your player board (your city) and perform one of the possible actions. The color of the .. Between 230 and 221 B.C., the ambitious and extremely young king of Qin, Ying Zheng, unified China, adding all the other so-called Warring States (ZhanGuo) to his empire. 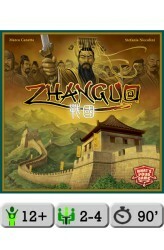 Through this, Ying Zheng became the first emperor in Chinese history, taking the title of Qin Shi Huang Di. Plenty of things had to change in order to make the Chinese empire whole, and Qin Shi Huang Di didn't waste any time. He divided the empire into prefectures, personally appointing central and local functionaries; afterward, he decreed that the same writing symbols had to be used throughout the entire nation. Furthermore, he unified the laws and the units of measure, particularly the currency, creating amazing conditions for the economic development and growth of the empire. Internal decisions were not the..